CT: My mother always loved poetry. The Winged Horse Anthology was a really important book in my childhood home. When young I memorized poems easily, and because of that, poems like The Lake Isle of Innisfree and The Lady of Shallot became part of the way I thought. However, the first poem I ever wrote was motivated less by what I read and more by jealousy. When I was nine, my younger brother wrote a short, goofy poem, and my parents fussed over him. Not to be outdone, I wrote a poem entitled These Happy Golden Years. Reading it now, I know it is terrible, but at the time several of my parents' friends accused me of plagiarism, which was very flattering. I wrote fairly regularly after that, but not in any serious way until the last year of high school. I read a lot. Over a hundred books a year. The books vary from nonfiction, to poetry, to literature, to popular writing. I try to expose myself to ideas I wouldn't necessarily have on my own. I also am really interested in the balance of images and ideas in poetry, Auden is one of my favorites for that reason. However when I start to write, all sorts of conscious ideas and efforts usually go out the window, and I just write. Then I figure out the details in editing. But it almost always begins with an image, even if that image is more explicit in my mind than in the poem. RL: Caitlin I love that your first poem was motivated by jealousy. I think that's a terrific and honest motivation for poetry. I have a secret suspicion (probably elitist) that the best poets the real poets start writing at a very young age (ha I can hear the throngs of late-stage poets coming to get me as I write this.) I too was enthralled with memorizing poems especially around nine years old. Your poems have a sparse elegance and yet are packed with emotion. I admire this and it's something I've never been able to achieve. Can you tell me a bit about your writing practice in terms of how often do you write how much do you revise do you set a schedule to write do you write at a desk or in your room or on the bus stuff like that? Victims of Ted Bundy is available here. CT: My writing schedule practice has changed a lot over the years. It depends on what kind of poems I am writing. When I am writing research-based poems, the Bundy ones for example, I have to put a lot of time into research. So I spent a fair amount of time researching and writing notes before writing the poems. I also read the first chapters of Truman Capote's In Cold Blood, over and over again, to get in the right head space. Because even though I think it is a flawed work in terms of research, his depiction of the individuals involved felt so real. However, regardless of what I am working on, I try to write every day. Usually with a cup of coffee or tea. I used to write mainly in coffee shops, but lately I have found that I am more comfortable writing at home. Usually on a comfortable chair near a window. At home I feel less rushed, but still very motivated. I believe the space I write in deeply affects what I write, although it is difficult to articulate how exactly that works. In September 2010, I wrote at the Metropolitan Museum of Art every day of the month. I brought friends with me sometimes, and I always varied the room, sometimes writing in the Astor Court, or near the Egyptian Temple, on the roof. It really changed the way I wrote, and it was the most productive period of my life as a poet. I put up a poem every day on a temporary blog, and out of the thirty poems, seven were published within the next couple of months. However I will also jot down poems on the subway, in parks, even while teaching class. Lately, I have been doing a three minute, prose, free write, before I start to do my actual writing. Sometimes after that, I put on a thirty minute timer, and really focus around a particular goal, like editing, or organizing my manuscript. I do not usually have the timer on while doing my actual writing, but sometimes the editing naturally leads me into writing new things. When writing, I allow myself to write a lot of terrible poems, ones that I know are awful even before I have finished writing the first line, but that I complete just to get out of my system. I write really quickly most of the time, the first draft only taking a couple of minutes. Many poets talk about the dangers of immediately revising, but I can't help it, I almost always start to edit right away, while the idea or intention is still fresh in my mind. I sometimes intersperse my writing time with reading or music as a way of gathering new ideas. RL: I love the idea of timed writings of writing fast and like you I try not to revise as I go but that is a goal I don't always achieve. Practice is extremely important to me as well (almost my religion) and I applaud the idea of allowing yourself to write terrible poems. I feel that it is important for any writer to allow oneself to write crap to get to the next poem. In fact I think each poem carries the seeds of the next poem in its mouth. It is interesting to me that you have written in coffee shops and museums! I've never been able to do it. Are you involved in a poetry community? Do you attend a non-academic workshop? Do you attend open mics or other readings? I am interested in how you interact with other writers if the idea of a writing community exists for you and if so what does it give back. CT: I couldn't agree more with the idea that each poem carries the seed of the next poem in its mouth. I am involved in a poetry community, although never as much as I plan to be. Before going to grad school at Sarah Lawrence, I did not know any serious writers outside of very organized academic workshops and classes. All my close friends worked in plumbing or social work, etc. So the idea of community at graduate school was one of things I was really intrigued and intimidated by. Currently, I have two writing groups that I regularly participate in. Both are very small, 3-4 people. I am close friends with almost everyone in the writing groups, but we are all good critics when we need to be, because we care so much about poetry. It is good because we have worked together for over four years now and really know each other's strengths and weaknesses when it comes to poetry. All the writing groups I have been in since graduate school have been made up primarily of former fellow students. Some I have been very comfortable in, and others I have not. I tend to write inter-related poems, which I think are harder to workshop. It is interesting being in a community of writers; even after four years, it still feels new to me. However, I have always trusted a few people around me for feedback, although they are mostly non-poets. I attend readings on a regular basis, but never as much as I want to. I can easily be motivated to see a poet I have seen read before again, but am less adventurous about new readers, even poets that I like sometimes. Of the readings I went to last month the two poets I enjoyed hearing the most that were Mark Strand and Hossannah Asuncion, both of whom I had heard read before. I love a good reading, but am leery of poets who go on far too long or who yell at the audience. However I very much prefer attending readings to giving them. I don't attend Open Mics and never really have, I don't think there is a thriving environment for them in NYC, but I am open to trying them in other cities. CT: I think I prefer fiction workshops. People are often less aggressive and take things less personally in them. My research involved police reports, interview transcripts, and phone calls from strangers, but it started much more casually, as a small portfolio for Stephen O'Connor's class on Research and Creative Writing. It seemed so strange to me that the serial killers are written about and focused on when so little is known about the victims. There were so many books and articles written about Ted Bundy and most people didn't even know any of the victims of names. I just used books and newspaper articles when compiling the first few. I wrote the first five in New Mexico while on vacation. I decided to pursue it further after talking to O'Connor about the poems. He really helped me craft the poems, figure out the tone, the approach. The whole series seemed very intimidating initially. Not only in terms of research but how other poets and professors reacted when they heard what I was doing. Some were clearly interested, others were less kind, some told me that I was no longer writing poetry, I was accused of being anti-feminist, all sorts of strange things. Once I knew that I was going to write more poems, I started to do more research. I bought every book that was available. I started to get case files. Some were hard to track down. Some police departments don't willingly give them out. Most mail them to you after an extended exchange. One police department emailed me scans of the files within 15 minutes. I also visited relevant locations in Washington and Florida. I remember Lake City particularly well. Kimberly Leach, a 12 year old was taken from her school there. The whole town was strange. We went to the school, which is now an administration building. As we drove away my mother commented how eerie it was and right then, out of a small clump of bushes next to the school, a man stood up. We had stood by the bushes minutes before and not noticed him. While in Lake City I got an opportunity to talk to Kimberly Leach's mother. I chose not to take it. I do not know if I was right or not, but one of the things I struggled with was whether or not to get in touch with people, the authors of the books I read, the families of the victims, and the survivors. One of the reasons I chose not to, ultimately, was the idea that these women could not be known. Bundy's actions denied us this opportunity. Even Carol Da Ronch, who escaped relatively unharmed, had her life changed by his actions. I also felt like it would change the tone of the poems, shift it away from the journalistic. Also because many of the parents had died and I couldn't possibly get in touch with someone close to every one of the victims even if they were willing to talk, I was worried that I would gather far more information on some women than others. The collection is complete, or rather it was until recently. I have a total of over forty pages, but under the 46-60 that are required to enter first book contests. I entered one or two last year that did not have page requirements, but found the whole process uncomfortable. I am not good at applying for grants, workshops, or book publications. I have decided to try again. This time I am trying to get the manuscript up to 50 pages in order to be able to enter it in most competitions. I have written several new poems in the last few weeks, focusing on several victims that are generally believed to be killed by Bundy, but are still technically classified as missing. I do not know if I will submit those poems, because I am still unsure of them. I would rather have too few poems than poems that I feel change the tone or integrity of the book. RL: Caitlin, that is an incredible and admirable amount of research and your attention to detail shines brilliantly in your poems. I also admire and respond to the passion you show to your craft and to this project in particular. I find that I have become obsessed with my latest writing project so much so that it's difficult for me to write about anything else. Tom Beckett once interviewed me and asked " Obsession, I want to say, is an engine of beauty, don't you think?" Personally I am a little bit afraid of the way passion slops over into obsession with me. Your poems are very cool and collected but a fire burns behind them. Tell me what you think about passion and obsession in art and how that affects your life. CT: That is a great quote. I think if you really devote your time to being a writer or a poet, there has to be a certain amount of obsession involved. It is something that involves so much time, but not necessarily any feedback or reward. I wrote for almost a decade without even trying to get published. Most of that writing was terrible and showed no particular promise. However I knew what I wanted to do, so I ignored the possible exit ramps. I believe that practice is a really important part of being a good poet, or an artist of any kind. In order to be a good artist who practices their art regularly, you have to be driven by something more then passion. Obsession requires a great deal more commitment. I was obsessed with the victims, I still think of them often. One of my students last term had a stepdaughter that went missing. She was sixteen, a good student, heavily involved with volunteering, very dependable. She vanished in early September and her family fully invested in trying to find her. The police only seemed to be involved in a very minor way. She still has not been found. It was so close to something that we like to think of as dated, distanced. It is one of the reasons I am rereading my notes, my sources, my case files. I am also preoccupied with the apocalypse, although I always feel like I have to make disclaimers about it. I do not think of it deliberately very often. But everything I write about, be it fiction or poetry, unless it is research based, usually ends up being about the apocalypse. Most images I end up gravitating to, are either apocalyptic or become so in my mind. I notice 'signs' every day, while walking, riding the subway, but I am attracted to them, not repelled. I sometimes wonder if I am the only one who spends half their time on the elliptical at the gym, visualizing the apocalypse. However I don't ever worry about the apocalypse. My husband and I don't have an escape bunker, hidden somewhere. I never think about it happening actually. The apocalypse I write about is more about absence, then anything else. In a way all my writing is about absence, my underlining obsession. RL: Caitlin, Good morning and happy Saint Patrick's Day or DRUNK DAY as I like to call it. It's snowing in Seattle. I've been thinking about this for a couple of weeks now I am also preoccupied with the apocalypse. It really caught my attention because of the surprise of it and because as a child raised in an evangelistic church I spent a lot of time being terrified of The Rapture and of course The Apocalypse is so closely tied into the book of Revelation that great horror story. And that got me to thinking about the word apocalypse its roots its origins. Off I went hunting for the biggest dictionary I own. What I discovered is that the Greek roots came from apokaluptein which means to disclose and also means to hide (apo.). This surprised (and I have to admit delighted) me. It is one of those words with hidden meanings secrets and mystery. 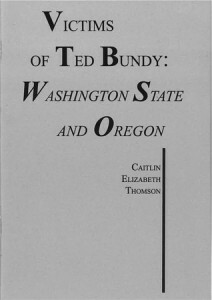 Your poems in Victims of Ted Bundy: Washington State and Oregon skillfully succeed in both revealing and hiding. Do you think your fascination with the apocalypse had anything to do with the way you wrote these poems? CT: I think that the apocalypse has a lot to do with how I wrote the Victims of Ted Bundy poems. Although not because it was something I was consciously thinking about. When I first started to write about the apocalypse, it was more or less by accident. I kept writing poems that were clearly not about the way the world was currently, that were recreating the world in disorientating, eerie way. They slowly built into something more. The apocalypse, historically speaking, is more about lifting the veil, the revelation of something previously unknown, the end of an era, not necessarily the end of the world. That interested me, how knowledge can change things. This idea of disclosure and hiding, this almost contradictory terms, make a lot of sense in terms of the Victims of Ted Bundy poems, because it is all about the information I have chosen to include, many things about Bundy, have been left out. In poetry it is so often about choosing what to focus on, what to ignore. In my version of the apocalypse and the Bundy poems, there is so much attention placed on absence, on what was there, and now no longer is. Although the issue is explored using very different language. RL: You wrote In poetry it is so often about choosing what to focus on, what to ignore. I think this is pretty much the nut of it the key to the craft. I'm curious what you think the future of small presses and poetry will bring. And where do you think poetry will take you next? CT: It is strange, considering how much of my life is spent reading or writing, how little time I spend thinking about presses. I am not very good at caring about the "business end" of writing. Two successful writers I take very seriously stressed that in order to get your work out there you have to have forty submissions to literary journals out at all time. I have been successfully doing that for almost two years now. I have become familiar with many interesting journals this way, and have found a few favorites. However with presses (small or large) I feel a little more overwhelmed, less knowledgeable, about the present and the future. I think that chapbook presses are really neat, because of the way they work as a stepping stone, and the fact that some are becoming more artistic in presentation then the average book. I felt like the publication and success of Anne Carson's Nox opened doors in terms of art/poetry books. I think it would be really neat if publishing took a step in that direction. With some of the smaller presses it seems hard to know who to trust. I worked briefly as an intern for a small press that had many unethical practices. Also about a year ago a small press contacted me about the Victims of Ted Bundy, with interesting thoughts and plans. We sent a few emails back and forth and then I never heard from them again. But other presses really are publishing more challenging work, than more established companies, that are stuck, in a way, with publishing more established poets. For a long time I was considering writing a poetry series on Hart's Island, a potters field in the Bronx, which has also been a Nike missile silo, and a women's insane asylum, among many other things. Since I am moving back to the West Coast in a month, I am pretty sure that I will not pursue the project. But I do feel that after the apocalypse book is finished I will once again start writing research-based poems.